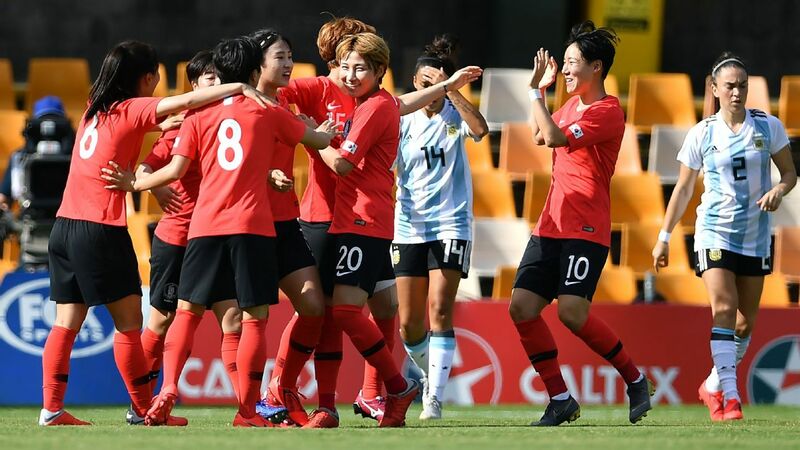 South Korea celebrate their opening goal in the demolition of Argentina. South Korea opened the Cup of Nations football tournament with an impressive 5-0 thrashing of Argentina. They beat the Albicelestes on Thursday, and look set to provide Australia's toughest opposition in the four-nation friendly women's football tournament. Mira Moon, Hwayeon Son and Sodam Lee scored before Soyun Ji netted a brace on a picture perfect afternoon at Sydney's Leichhardt Oval. Malaysia head coach Ong Kim Swee returned to Kuala Lumpur on Sunday, having told his players that they must learn from their run to the quarterfinals of the AFC U23 Championship in China. The Young Tigers' stint at the continental championship came to an end on Saturday, but not before putting in an impressive performance against South Korea. The narrow 2-1 defeat to the Koreans suggested their place in the last eight had been deserved. Han Seung-Gyu shattered Malaysia's dreams with a late goal for South Korea to send Ong Kim Swee's side home from the AFC U23 Championship on Saturday evening after a 2-1 quarterfinal victory in Kunshan, China. It sets up a semifinal meeting for the Koreans with Uzbekistan, who thrashed Japan 4-0 in the last eight. Ulsan Hyundai midfielder Han burst through the tiring Malaysian defence to claim the winner in the 85th minute of an enthralling clash. Malaysia head coach Ong Kim Swee has told his players to forget the historical significance of their run to the quarterfinals of the 2018 AFC U23 Championship and focus on their crunch clash with South Korea on Saturday. Malaysia clinched a surprise place in the last eight of the continental competition on their debut appearance, thanks to a 1-0 win over Saudi Arabia, which saw them advance from Group C.